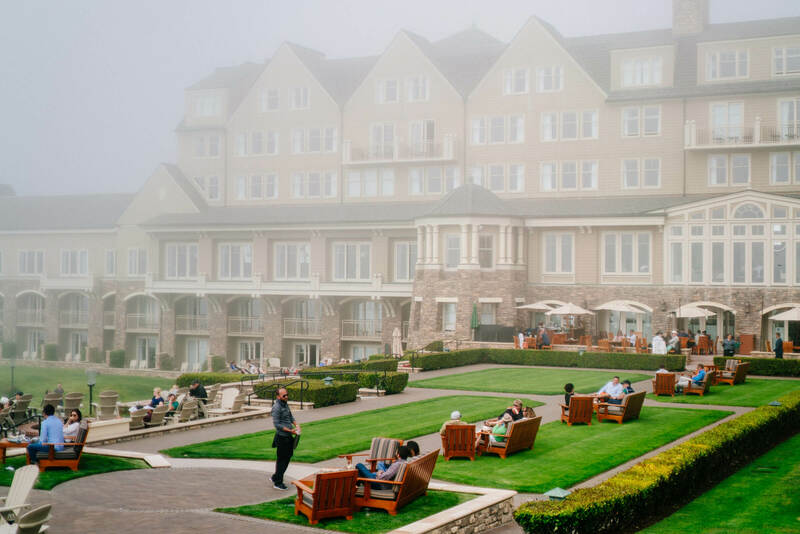 We love seasonal fruits and vegetables, so when The Ritz-Carlton Half Moon Bay invited us to experience their new Saturday Farmers Market Brunch, we made it a priority to take a little trip down the coast as soon as possible. The area around Half Moon Bay is full of farms, so the chefs at The Ritz-Carlton’s restaurant, Navio, decided to showcase the freshest local produce from neighboring farms at their Saturday brunch. The Farmers Market Brunch on Saturdays is intended to be a little more casual than their Sunday brunch, but as you can see from the photos below, it’s a pretty remarkable spread! The views from the restaurant are incredible. It overlooks the ocean, and we had the best time watching the waves come crashing in as the water got pretty rough. One of the servers mentioned that it had been exceptionally cold and foggy lately, and that at times the fog is so thick that it streams into the restaurant when the windows are open. Brunch includes a “build-your-own” Bloody Mary. Guests get a notecard to make selections to customize their cocktail. Clayton decided to be adventurous and try his made with gin, and we were surprised by how much we both liked it. It added even more complexity to the drink. We’re thinking about trying it at home sometime. He also went with extra horseradish, jalapeno, and spicy salt. We’re thinking about picking up a few of these specific style of mason jars and this spicy salt to recreate these cocktails for a brunch party. Sarah’s had pineapple, which was also really good (note: if you’re a pineapple fan, you need to try this pineapple basil margarita). After we filled out our notecards to get our drinks under way, we headed up to check out the incredible spread of food. 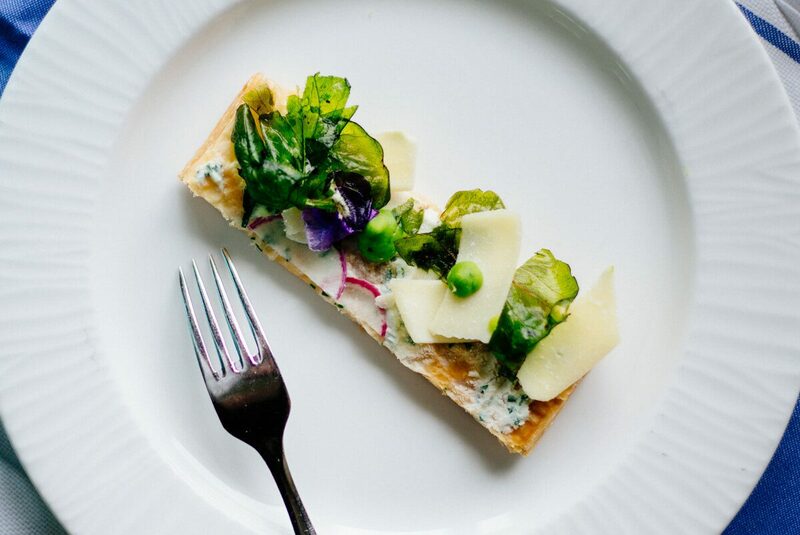 We absolutely loved this Herbed Ricotta, Fava Bean, and Spring Radish Tart. The chefs at The Ritz-Carlton were kind enough to share the recipe, which you can get here. 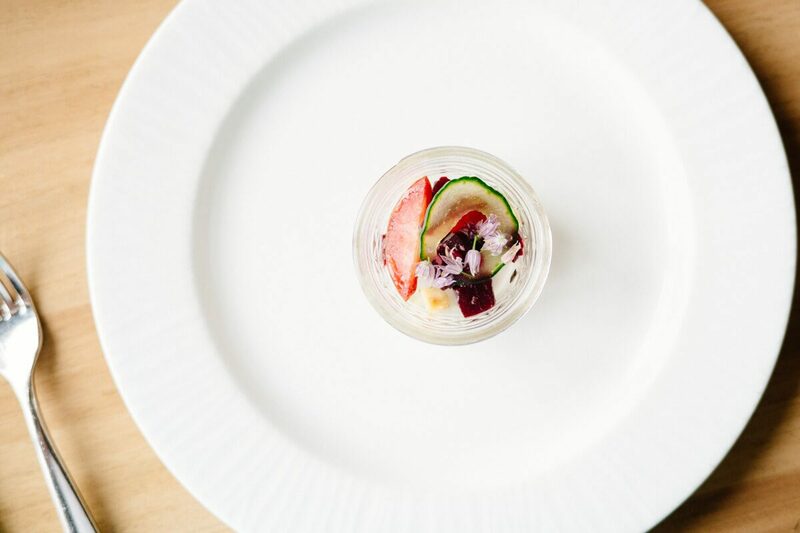 One of Clayton’s favorite dishes was this Dungeness Crab salad with Thai Gelée. They were so beautiful. We loved the idea of serving them in these little jars, and Clayton put it on our to-do list to order more because we use them in our kitchen for everything. They would be great for a party. How beautiful are these roasted carrots? They are a great reminder that when you have the freshest and best ingredients to work with, sometimes the simplest preparation is the best. Brunch also featured a huge selection of charcuterie, accoutrements, cheese, and lots of different crostini with delicious spreads. Clayton loves anything that comes from the ocean, so he made a beeline to the raw bar, which had a great selection of shrimp, oysters, and lots of accompaniments. The Saturday we went, they were featuring Miyagi oysters from Point Reyes. So many options! We are pretty sure these copper butter warmers are on our wish list. We especially loved the Roasted Beets, Nectarines, Cucumber, and Hazelnuts. We typically find ourselves roasting beets about once a week when they are in season. We usually make them this way, but again, The Ritz-Carlton was generous enough to share the recipe for this simple and elegant salad, which you can find here. You’ll need these jars for this too; we are planning to make this ourselves ASAP! What would brunch be without dessert? The Ritz-Carlton has that covered too. From fresh fruit to ice cream to cookies and tarts, the spread of desserts was nothing short of amazing. These miniature lemon cheesecakes with blackberries were by far one of our favorite of the desserts. We liked them so much, we asked for the recipe, and it’s coming shortly on The Taste SF! If you live in the Bay Area, make it a priority to check out this amazing summer brunch. It’s less than an hour’s (beautiful) drive down Highway 1 from San Francisco. After brunch you can play a round of golf or relax by the bonfires overlooking the ocean. It’s such a scenic retreat from the city, we decided on the way home that we should go more often.